Highly-regarded defensemen Cam Fowler and Brandon Gormley were both projected to be selected among the top five picks, but instead went 12th and 13th, respectively, to Anaheim and Phoenix. It was just part of a surprising night in Los Angeles. 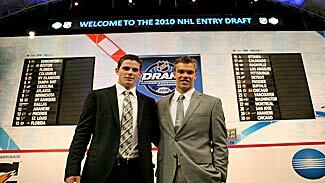 There were no surprises in the first two selections in the first round of the 2010 Entry Draft -- call it the Taylor (Hall) and Tyler (Seguin) Show. But a lot of things didn't go according to form through the rest of the first round. Johansen was ranked No. 10 among North American skaters in the final rankings by NHL Central Scouting -- and while he had risen from 150th before the season to 16th in the midseason rankings, having a team take him at No. 4 was a surprise. "Our goal has constantly been to add the best player into our lineup that will help us build our young core into a team that consistently competes for the Stanley Cup," Isles General Manager Garth Snow said. "Nino was extremely impressive in the World Junior Championships playing for Team Switzerland, using his size to create space. He is a big power-forward who will add size to our lineup for years to come." The surprises continued -- partly in terms of whom wasn't taken. Defensemen Cam Fowler from Windsor of the OHL, ranked No. 5 in Central Scouting's final rankings, Brandon Gormley from Moncton of the Quebec League, rated No. 6, both fell out of the top 10 -- as did defenseman Mark Pysyk (No. 7), California-born forward Emerson Etem (No. 9) and defenseman Derek Forbert (No. 9). The Rangers definitely were in the "bigger is better" camp. "We feel very fortunate to be able to select Dylan and add a player of his caliber to our strong core of prospects," GM and President Glen Sather said. "He brings size and a physical presence along with good mobility and outstanding character. We've watched him improve throughout the year and are looking forward to his continued development." Dallas took the top-ranked goaltender with the 11th pick -- but the choice of Jack Campbell was a surprise in its own right because the Stars acquired Kari Lehtonen from Atlanta late in the season and signed him to a three-year contract. The surprises continued when St. Louis, picking 14th, took Tri-City center Jaden Schwartz, who led the USHL in scoring in his first season in the league. Schwartz, who's headed for Colorado College, was rated 28 th among North American skaters in Central Scouting's final ratings -- up from 41 st at midseason. After Forbert went to Los Angeles at No. 15 following a trade with Florida and Russia's Vladimir Tarasenko, the No. 2-rated European skater, was taken by the Blues at No. 16 after a deal with Ottawa, Colorado pulled another surprise by taking center Joey Hishon from Owen Sound of the OHL with the 17th pick. Hishon was rated only 55 th among North American skaters by Central Scouting, down from 46 th at midseason. A broken foot derailed much of his 2009-10 season after he had 37 goals and 81 points in '08-09. Etem was the highest-rated of several California players expected to go in the draft -- but the first to be picked was Beau Bennett, who went to Pittsburgh at No. 20. Bennett, who's headed to Denver University, was 32nd in Central Scouting's final rankings, up from 48th at midseason. The Gardena, Calif., native, who got his hockey baptism playing roller hockey, led the British Columbia Junior League in scoring by piling up 120 points for Penticton. Pysyk finally went to the Buffalo Sabres at No. 23, while Etem, a native of Long Beach, drew plenty of cheers when he was taken by the Ducks at No. 29. One last surprise was the selection of goaltender Mark Visentin from Niagara of the OHL by Phoenix with the 27th pick -- Visentin was ranked fourth among North American goaltenders by Central Scouting, meaning that the top-rated goaltender, Calvin Pickard, was still on the board going into Day 2.